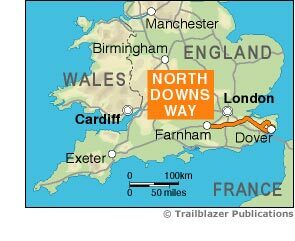 The North Downs Way, a 131-mile (211km) National Trail runs from Farnham in Surrey to Dover in Kent via Canterbury, winding its way through the protected landscape of two Areas of Outstanding National Beauty, the Surrey Hills and the Kent Downs. The path passes medieval churches, castles, Neolithic burial sites, vineyards and numerous WWII defences. There are literary associations with Swift, Cobbett, Dickens and Jane Austen.